Professional, high quality Stethoscopes for all medical, laboratory & research uses. All have adjustable, chrome plated binaurals and long life chemical & UV resistant PVC 'Y' tubing. 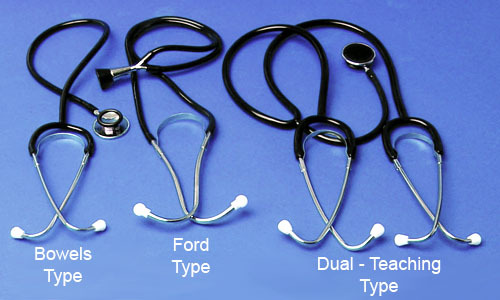 Ford type responds a little better to low frequencies - an all purpose stethoscope used for general respiratory and circulatory studies. The Bowels type has a higher frequency response and is the more commonly used of the two types for general diagnostic procedures.